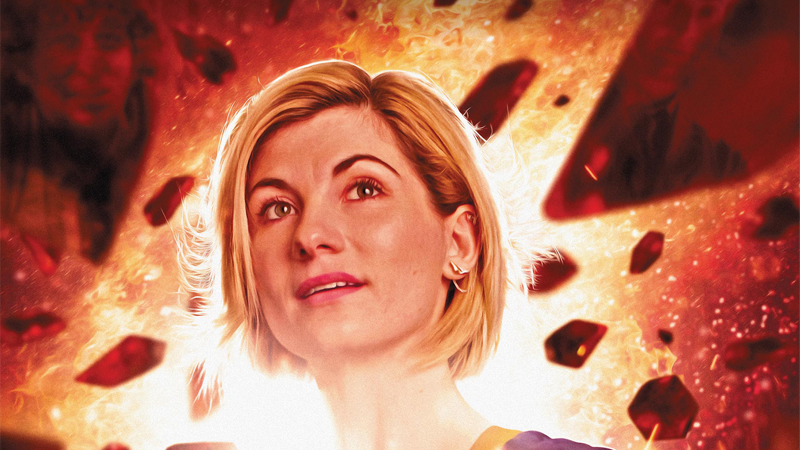 The Doctor looks back on her many pasts in the cover for The Many Lives of Doctor Who. This autumn, the Thirteenth Doctor begins her adventures in time and space—not just on television, but in comics as well. But just before the real fun begins, a new comic series will see the latest Doctor look back on her life... or, rather lives, in an intriguing twist on an anthology series. As revealed by Entertainment Weekly today, Titan Comics will precede its incoming Thirteenth Doctor ongoing with The Many Lives of Doctor Who, an anthology collection featuring stories starring every prior incarnation of the Doctor, including John Hurt’s War Doctor. Each story, cast as an “unseen tale” from the Doctor’s long past, will have their own creative teams. The gorgeous alternate cover for The Many Lives of Doctor Who. What’s most intriguing about the anthology though, is its framing—it’s set during the Twelfth Doctor’s regeneration, as a “life flashing before your eyes” sort of thing. That might make it seem like the Thirteenth Doctor isn’t actually going to be in it, but Titan are pitching The Many Lives as a “Volume 0” to the Thirteenth Doctor comic, as well as a direct-lead into the new ongoing title. Given that the series’ artist Rachael Stott will have work in the book, maybe we’ll get just a teeny tiny snifter of what’s to come for the new Doctor’s comic book adventures, too. But it’s interesting to see the creativity being used to give us tastes of Jodie Whittaker’s new Time Lord before we even really get to know her ourselves—if whatever the framing device for The Many Lives is ends up being as clever as the beautiful, single page Thirteenth Doctor story we got with Titan’s Doctor Who Free Comic Book Day special, we could be in for a treat. The Many Lives of Doctor Who will hit shelves this September.